A few weeks back we were out to dinner with some friends and they showed us photos of their new granddaughter by passing us their phone and having us scroll though a batch of images they had taken and/or downloaded. Needless to say, baby was beautiful and the proud parents were, well, proud and we all did the requisite amount of cooing. 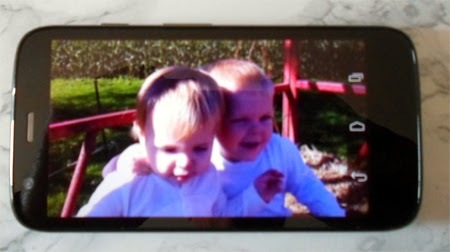 But then it occurred to me that I could not show them—or anyone else—pictures of my grandsons. In fact, I have never shown anyone a picture of my grandsons (bad Grandpa!) for the simple reason that I don’t have any. All I have are JPG files from my digital camera or downloaded from Facebook, and all of them are on my laptop. Short of going to a specialty shop, I doubt I could find anything resembling a wallet-sized photo that I could carry around with me. So the notion of getting a smart-phone flitted into my mind and was promptly batted away by the grumpy old luddite fly swatter because they are just annoying gadgets that serve no constructive purpose and will be rendered useless as soon as the next big solar flare erupts. Oddly, despite being in the computer business and having ridden the bleeding edge of technology back in the barnstorming days of computing, I am a bit of a technophobe. I think it has to do with it all having gotten away from me. When I understood the technology, I liked it and used it to push the boundaries of what was possible. But now all the hardware, software and inner workings thereof are as mysterious to me as the Dead Sea Scrolls, and just as decipherable. Lately, however, I have come to realize that waiting for it to all go sour or be made redundant by the Next Big Thing was a bit like being a guy who made musical cylinders in the 1890s and refused to have anything to do with records or record players because they were just a temporary fad and then claiming himself right when—100 years later—they were replaced by cassette tapes, CDs and iPods. A perfectly acceptable mobile phone next to the world's most expensive photo wallet. My old phone made phone calls and sent text messages. It cost £9 and had an instruction manual that fit on a folded piece of paper. My new phone does Facebook, Twitter, Google, Amazon, Kindle, Skype, photos, movies, word processing, spreadsheets, power point, voice recording, e-mail, music and a host of other tasks with varying degrees of usefulness. The instruction manual is 66 pages long and “making a phone call” is on page 23 (oh yeah, it makes phone calls, too). And it cost somewhere north of £9. Very far north. But here is the absolute worst thing about it: I love it, and can’t imagine how I was living without it all these years. I don’t have to tell you all that it can do because you all have one and are now wondering just how I did get along without one all these years. I’ve been having a blast with it. I downloaded a ring tone maker and set up obnoxious ring tones for a number of my contacts, but then someone called me and this song erupted from my pocket and scared the life out of me so I set it back to the default ring tone. Otherwise, it’s good for a lot of useful things, like reading books. So next time you see me, ask me about my grandchildren. I’d love to show you some pictures of them. I hit that point about the time CP/M and floppies were being used (remember the Kaypro II?). I still have a trac-fone. Sigh. I have to admit that I too don't jump at the next gadget that comes along... but my children (all grown) all had iPhones and a few years ago convinced DH and I to get one. And yes, I love it... can't imagine living without it. Love the instant pictures you can send or get while talking to someone, love the texts from kids throughout the day, and especially love being able to put all the little things I can't remember (like the date of my last flu shot, my Max Perk #, etc.) into the notes or reminder file. And when I can't think of a word (Senior moment), I can look up a similar one and there it is! Yes, I do believe when we are old (-er) and beginning to lose our faculties, we will still be punching away at invisible i-Phone buttons. Oh no, another person succumbs! I can feel myself edging towards that slippery slope... I have an ancient flip-open phone (which I'd take a picture of with my husband's iPhone and post it, if only I knew how) which I really like, because it fits into my pocket nicely when I'm out running out or walking, alongside the dog poo bags, treats, car keys etc, and if I had an iphone I'd have to take our household spare phone out with me because it'd be too big. Mine texts, phones and has a useful calendar, and I have a Kindle Fire for everything else - email, internet, playing games and reading books. 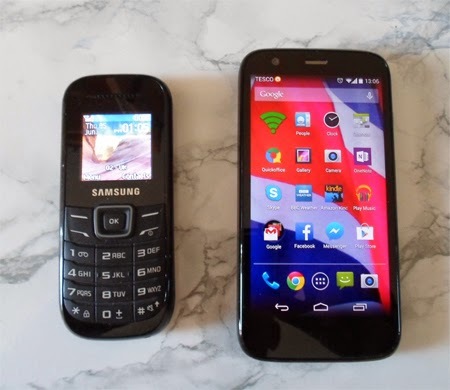 But even my son, who kept his Samsung phone, a slightly cooler version of your old one, in an ironic, different-to-other-teenagers-way until this year, has now got an iphone, I'm starting to feel embarrassed about my ancient phone. Problem is, there's nothing an iphone can offer that I can't do between the old phone and the Kindle Fire, or if there is, I don't do it anyway. Sigh. I could still reminisce about Windows 3.1, or even Windows XP, when I still knew how to work it all! Well, ish. We've had the conversation about Windows 8, which is useless and confusing. Change is good, if it serves a useful purpose. Change for the sake of it is just annoying. Cute grandkids though. And the G-boys are cute, aren't they?